Keep an ear open when your kids are playing COD, or they might hear a dirty word. Here's the short summary: Some parents just figured out that online gaming platforms like Xbox Live and the Sony Entertainment Network are a hive of villainy and bad words. 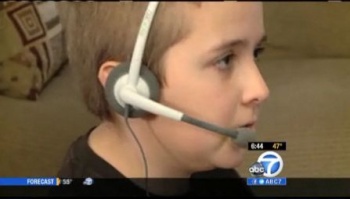 An ABC News report from KABC in Los Angeles ran a report on the foul language and bullying that can go on while Junior is playing Call of Duty. A parent who regularly games with his sons is appalled by the level of profanity he encounters shooting bad guys with automatic weapons and the report shows how to shield your spawn from the barrage of bullying. "Incredible levels of profanity, racial epithets, homosexually-oriented epithets. We're talking 8-, 9-, 10-, 11-year-old kids who are getting exposed to this regularly," said Kevin Roberts, author of the book Cyber Junkie. A father of several boys, Matthew Kinney, said it's important to listen to what you're kids are hearing from other players. "Don't let your kid go upstairs and close his bedroom door, and sit there and play all night," he said. "That's crazy. You have no idea what's going on, who's saying what." Finally, "Internet Safety Expert" Parry Aftab said that it's possible this profanity has no bearing on winning the game, but is simply meant to hurt the other players. "They may trash talk. They may be calling you names. They may steal their passwords. Or a lot of them may gang up on one online, not because it's a good strategic win, but to hurt the other person," said Aftab. Aftab made sure to mention that Microsoft has teams meant to police their online service. "They have an Xbox LIVE enforcement squad that is one of the best enforcement groups looking for grooming activities and online sexual predators, as well as cyber-bullying," said Aftab. As much as I would hate to have my parents with me when I was playing videogames as a child, I kind of see where these warnings are coming from. All of the swearing and homophobic comments I've heard - even when playing an innocuous game like War in the North on Steam - is a big reason why I don't like playing multiplayer. Some kids don't have the willpower or strength to have a tough skin to shake off potential abuse when they are 8 years old. Until they learn to play more civilized games like Magic, it probably isn't a bad idea for parents to pay attention to what is being said over the headsets. And threaten to beat up any gamer who says the word "Boobies."